I received for review the latest twin LED wireless bike light from ITUO. The WIZ20 has twin XM-L2 U3 neutral white LED, user programmable modes, internal replaceable 18650 batteries, USB chargeable capability and QR bar mount. Checked weight including two ITUO 3100mAh is 246gr plus QR clamp at 34gr giving a respectable total of 280gr. The overall shape is rectangular with a slightly wider head and the body is tapered towards the back of the light were the battery loading door is. When you look closely at the light the shape is quite complex with the underneath rounded and the top squared up. The fatter head curves very gently towards the body which allows your thumb to be positioned on the curve giving a very good hand grip once used off the bike. The rear loading door is made of aluminium and is released by an upper plastic catch fitted on the main body. The door itself has a rubber 'o' ring and sports a small PCB with spring loaded terminals. The connection inside the battery tube are made by springs, so there is no chance of battery rattle. At the opposite end of the light are the two XM-L2 U3 LEDs behind two clear optics (I understand from the manufacturer that they are at 10 degrees). The USB port is forward of the bracket and has a double lip rubber cover, so no risk of water ingress. The cooling fins are very minimal and found on the head and underneath rear sections of the body. The head and body are one single cast with only the bezel and the rear door as separate parts. Using the single casting for head and body should help in heat transfer and heat dissipation. he switch protrudes from the body of the light (around 1.5mm) and has a positive feel so this should be OK to use with gloves. The battery condition light is showing through the switch with a blue light for 100%-20% and red 20% or less. During my two tests, the blue light stayed for 85 to 105mn according to battery used and the red for 60 to 80mn again according to the battery used. With only two colours the low battery system is a little basic but works fine giving you a warning in excess of 60mn continuous run time on high mode. The laser branding is quite minimal and is on the left hand side of the light. The light operation is similar to their WIZ1&2, but the WIZ20 comes with two separate mode platforms which are fully programmable. A USB cable is supplied as well as an A4 comprehensive instruction leaflet. The light is well package and protected in a high quality cardboard box. The light quick release lever has a positive locating feel and hold the lamp in place without rattling. Another good feature is that both platform steady modes have a memory (after a stop and turn off, when you power on again you don't have to cycle through all the modes to get to the one you was just using).
. A CLICK from the OFF position will always turn the light on to the last steady mode used in the default setting 1. A further CLICK from the ON position will cycle through the steady modes low, med, high. A PRESS from ON position will access the special mode-dim 80 lumens. A CLICK from the special mode position will return the light to the last steady mode used. A LONG PRESS will turn the light off (it will go through the special mode).
. A DOUBLE CLICK from OFF position will always turn the light on to the last steady mode used in the default setting 2. A CLICK from the ON position will cycle through the steady modes low, high. A PRESS from ON position will access the special mode-warning flash. A CLICK from the special mode position will return the light to the last steady mode used. A LONG PRESS will turn the light off (it will go through the special mode).
. The light as a memory and will remember the last steady mode used when the light is turned off. 2. DOUBLE CLICK, the light will flash quickly indicating you can start customisation. 3. Increase the brightness in 10% increments using a CLICK (when 100% brightness is reached the light will flash quickly); dim the brightness by HOLDING the switch. DOUBLE CLICK to set the desired brightness while ramping up or down the brightness levels. 4. Once the desired brightness has been set, CLICK to return to normal operation. 1. When in special mode, DOUBLE CLICK the switch. The light will flash quickly indicating you can select the special mode you prefer. 2. Using a click to cycle through the four special modes (dim, day flash, night flash and warning flash). DOUBLE CLICK to set the desired special mode. 3. Once the desired special mode has been reached, CLICK to return to normal operation. When the light is off, LONG PRESS the switch for 5 seconds, the light will flash 10 times and then turn off. This indicates factory settings have been restored. I have been riding with it for over a couple of weeks now during my daily commute. So for the moment I've only tried the WIZ20 on the road and on a farm track when I took some beam shots. The beam has a nice neutral tint and is pretty tight but with still enough peripheral lighting. Some riders may prefer a wider beam for a bar light, but *for my daily commute this was fine with a strong patch of light straight ahead and decent enough sub lighting on the kerb. I still have to try it during a forest single track or an XC ride, so will add to the review later on. I understand from ITUO that on the sample sent to me, the optics are standard commercial 15 degrees optics. I believe that they can be easily changed if a wider beam is required . The switching was fine with my autumn gloves and the fitting and removal from the handle bar clamp easy. The fit is tight with no rattling from the clamp to light. The clamp fits tightly on 24mm or 35mm bars as this was tried on my two bikes. We've recently had lots of heavy rain here in the UK and the light was also fully tested in windy and wet conditions. No problems here. Like with the WIZ1&2, I have been using their twin flash mode during the day and warning flash or low mode at night. With the tests I did, the warning flash was coming with the same brightness as their low mode (250L with a pulse of around 350L (estimated)). This is a good feature and allows you to see as well as being seen. I only use the warning flash on lit up roads, as on a dark roads, I fine the pulse a little tiring on my eyes. 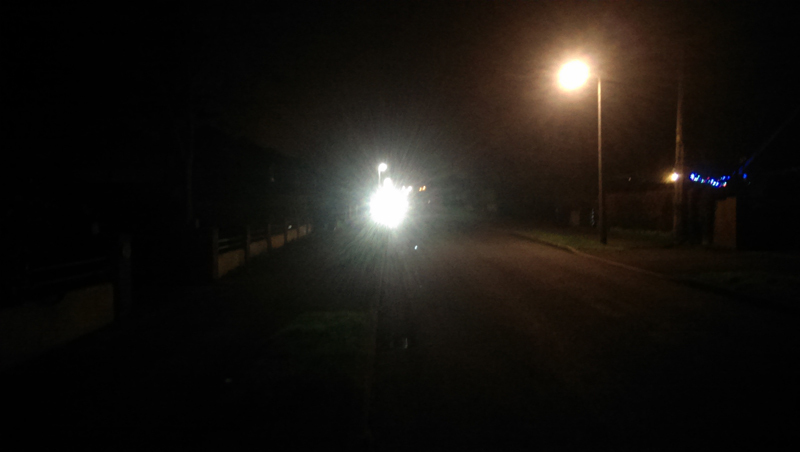 Something you have to be aware of is that this is an extremely powerful light and you do not want to cycle through traffic with the 1500 lumens on. I ride on the road on low when there is traffic around and I have the WIZ20 angled down to get the centre of the beam approximately at 4/5 yards ahead of my front wheel. 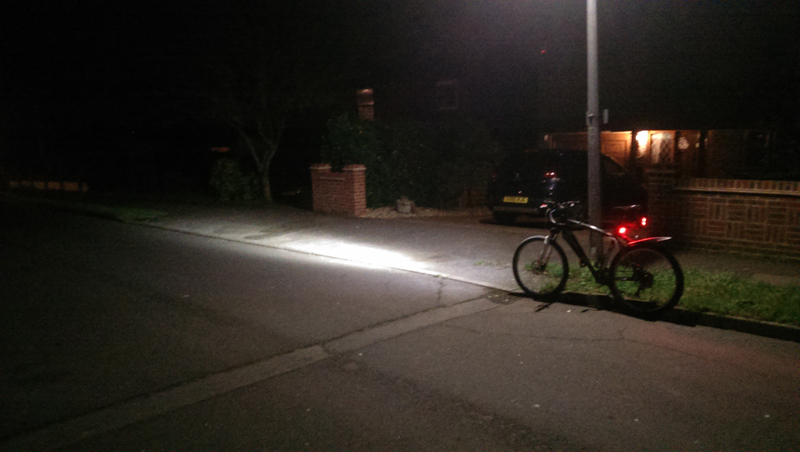 This gives plenty of useable light and minimises some of the glare to oncoming traffic. I would advise anyone using any high powerful bike light on the road to prop your bike on a kerb and walk 25 to 55 yards ahead and look at the beam. You will be surprised how unfriendly they are if not adjusted properly. The reviewed lights are tested with my home made light sphere/light box and a cooling fan is used between the readings (please note there will be a small margin of error for the readings as the light is removed and repositioned on the sphere for the various readings). As this is a home-made integration sphere, I cannot make any true claims as how close my result would be to results coming out of a lab integrating sphere costing thousand of pounds, but this does give a rough idea as how the light performed and enables you to monitor the output versus runtime. As you can see from my test the PLUZPOWER 3400mAh batteries give a slightly lower output for the first 60mn but a higher one for the reminder of the runtime a good alternative to Ituo 3100mAh battery. Please note my figures are in LUX and the base figure used was taken 30second after turn on. 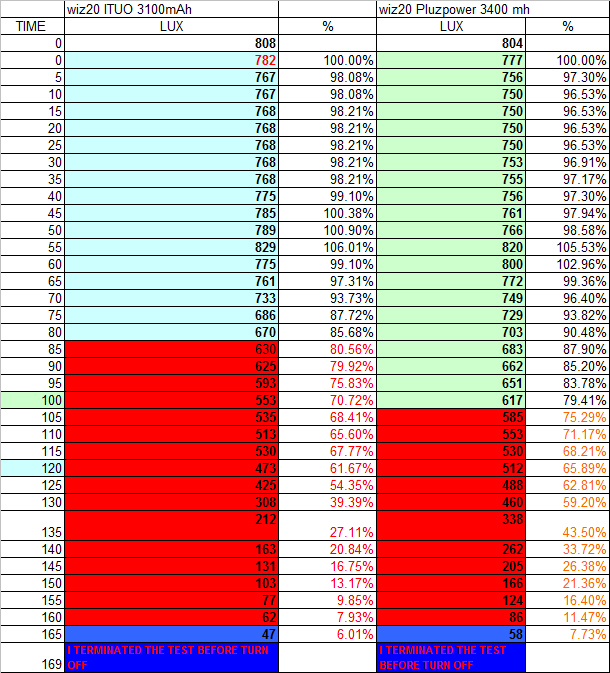 What the test does show (confirmed by the photos) is that some of the mid range increases are not around 10% but a lot less. I became curious to see what sort of result I would get from my Gloworm X2 which has a similar program and did cost more than twice as much. The X2 figures were closer, this said , the ITUO still has a very good incremental customization program which for me is a big plus. Please be aware that this test has not been done to confirm the actual Lumen output but has been done to get an idea of the actual incremental increase of the light output in LUX. This, with the photos can help the reader to set their custom light output/ maximum battery running time, by carefully choosing the incremental levels. the average LUX readings I am getting from my 1500L GLOWORM X2 are 848 000LUX and I am getting 808 000LUX out of my WIZ20 so I recon the WIZ20 is pretty close to the 1500 lumens advertised! The light out of the GLOWORM X2 is also whiter than the WIZ20, below is a photo taken of the X2 beam, on the same night and with the same ITUO 3100mAh batteries in the CB SEEN twin battery box . The beam is a little different due to the different optics used in the two lights and unfortunately for the X2, slightly angled towards the left of the photo, this was noticed when I viewed the photos on my computer. Please note, per all reviews some of the Fors and Against are down to the reviewer's personal preferences. For: compact and fairly light weight, good QR clamp, USB rechargeable, replaceable standard 18650 batteries, long run time, good choice of modes and fully programmable, good beam and interchangeable optics, price. Despite the fact that this is a bike light, the WIZ20 feels well balanced in my hand and I can see myself using this around the house or while camping and it can tail stand for candle lighting. ITUO WIZ20 with its fully adjustable modes, raw power, replaceable and USB chargeable 18650 battery (not supplied) make a very good contender for both road and off road use. MSRP $109.99*. Readers, please note that I have received the WIZ20 from ITUO as a review sample and, as such, did not have to pay for it. There is another MTBR review of the ITUO WIZ20 and I would encourage any readers to also read Tigris99 excellent review. Last edited by Skyraider59; 02-16-2016 at 05:09 AM. 1) the battery door opens with a pop and there's nothing to hold the cells in so might potential fall out in a crash. last years leyzne lights had a bit of pivoting metal to hold the battery in place in case the door opened by accident. 2) the bat mount qr lever seems to pop open a bit to easy as well. Hi Spankone, so looks like there is 3 out there for reviews , I hope either yourself or Tigris will be able to carry out some LUX test, allays wanted to find out how accurate my cheap integration sphere is, very posh word for a polystyrene light box. As mentioned in my review I have not been able yet to test it on our local forest trails, so the review is ongoing. Regarding the battery popping out due to spring load, good point as the release lever is positioned on the top of the body, and just need a press or tap, this could happen in a crash scenario! Never used a Lezyne with the pivot safety catch inside as you mentioned, but this does sound very fiddly, specially with gloves, if you had to change the batteries on the side of a trail! Regarding batteries, I kind of had the opposite, looking to get the longest time out of the WIZ I am trying some new PLUZPOWER (Panasonic cells) 3200,3400,3500, and I have found that ITUO 3100 fit well, but the higher capacity PLUZPOWER batteries which have a slightly bigger OD are very tight, so much that the 3500 will not go in. This evening while cycling back home, I have tried my QR lever to see how easily this open, you are right, there is certainly enough friction to keep it close but, you do not get the kind of "firm click" that you get with others to know that the lever is well secured. This may be due to the plastic material they have used (quite flexible) or may be the design of the shape of the lever (different lever shape to the WIZ1&2 QR lever). Different discharge line obtained from different batteries ITUO 3100 and PLUZPOWER 3400 mAh, also on my graph is a the discharge line of my YINDING YD running on twin PLUZPOWER 3500mAh batteries, the light was turn off by myself as it was very late that night, but I suspect It would gone a little more. We will improve and clear the potential issues you mentioned. One more suggestions. I've only been able to get to grips with the programming by using skyriders instructions. And it still took some getting use to. For the first time it's hard to know if your in the programming mode or not. It just looks like your in a normal flashing mode. My suggestion if possible would be to use the battery status indicator to flash between blue and red to indicate that your in the programming mode and for a double red flash when you reach the upper and lower limits of the brightness. It also may be easier to cycle through all 10% increments rather than adding another button press to the mix which adds confusion. We're all light geeks here and yes we maybe able to program it. But it should be easy enough for a normal person to do as well. We will consider your suggestions, but not sure if we will acheive them at the moment. Regarding the modes programming , I was OK with it as ITUO are using a similar way as the GLOWORM X2 with which I have been ridding with as a lid light for a year now. Saying that, I do not reprograms my lights that often so do do it with the instruction as backup. I do like your idea of using the battery warning light as a visual aid as to where you are in the programming, I think this would be a lot easier to understand and would eliminate the self questioning of where am I! Just wanted to say thanks for all the beams shots. Looks like a nice light. As a commuter lamp I don't think you could ask for more. One of my earlier criticisms was that the Wiz20 didn't use a Gopro mount. Well, I was rethinking today that perhaps maybe the decision to use a custom mount wasn't such a bad idea. Since Gopro mounts are kind of "universal" if someone were to leave a Gopro mount on a bike while parked outside it's quite possible that someone might try to lift it. That would be a PITA to say the least. At least with the Wiz20 mount you can leave it on the bike ( and feel *relatively secure it won't be lifted ) because it really serves no purpose to anyone who doesn't own the Wiz20 lamp. ...Oh...quick tip to anyone using this kind of lamp; Every couple weeks you want to buff the battery contacts with a pencil eraser. This will remove oxidation from the contacts and give a better electrical connection. ( This applies to all such devices including torches and battery boxes ). Doesn't hurt to buff the battery contacts either. You could also use alcohol or liquid metal cleaner but the eraser works almost just as well and is quick and easy. ( On my torches I do the threads on the caps as well ) You'd be surprised the black oxidation that comes off if you don't do in a while. The more oxidation on the contacts, the bigger the volt drop at the contacts. which have been retro fitted to my SSX2 and my Yinding YD, i much prefer this fitting to the rubber band type. I have a GOPRO QUICK RELEASE mount on both of my helmets and with this I can interchange all my lights in seconds GWX2, SSX2, YINDING and WIZ1&2. Regarding leaving QR on bike while unattended, always a very risky business here in the UK! Regarding the GOPRO on the WIZ 20, I think this is do-able as the WIZ male jaws of the QR are bolted on, so I would think you could fit one of the above adapter, my only concern would be, the single bolt/screw fitting to the body of the WIZ. Also, the WIZ20 for me in its form is a little to heavy and bulky for an helmet light. the second one activated by a double click got 2 separate modes. I always favour the single click to a twin click to activate my lights, but I would say that I mainly use two modes on or off road, so I personally would prefer the platform two to become platform one, with only two modes access-abe by the single click from off. I kind of always use low kind 150-250L and full power, put this may be due to the type of trails I cycle on. Am I the odd one out ? as GW, ITUO and probably GEMINI have there 3 mode platform as a primary platform! Dont try to use that gopro mount or any other adapter for this light, the mount at best will rotate once you hit bumps, or adapter will fail. As for UI options, personally I prefer 3. A low for climbs, mid for flats and high for fast descents. But that's a personal preference type thing. I you should have my first MTB ride with the WIZ20 this evening, not sure what will do forest single tracks or XC? I will also have my YINDING YD on the bar to make a comparison, Yinding is fitted with one of the above adapter with a double sided sticky tape to stop it rotating, will see if this work ok, this is fitted on the WIZ1 GOPRO QR clamp. How to feel a complete idiot!!!!!!!!!!!!!!!!!!!!! Finally got to ride this Friday, after 30mn drive I got to the forest, got the bike of the car and started to get my kit out only to find out that in my rush to leave the house, I had left the WIZ20 by the front door at home! Luckely I had the Yinding already fitted to my bar and the GW X2 on my helmet, so I had plenty of light! Did our forest club ride, we stayed on the lower trails of Friston forest as the upper trails are extremely muddy. Were out for a couple of hours, I was running both of my lights on twin cells instead of my usual 4cells battery packs. Just about enough battery life for two hours using about half the time on low and the rest on high. I don't think I will be able to put a night ride before January now. Real shame, I was really looking for testing the light off road! Please note PWM CAN NOT BEEN SEEN BY THE HUMAN EYES (well certainly not by mine) This has been reported to ITUO and they have told me that this will be rectified for the production lights. I have changed the standard left hand optic for a frosted 30 degree. Here are some photos, very strange that the photos with the standard clear optics appear warmer and not quite as bright, all I can put it down is weather condition, ie the one taken with the frosted optics were taken on a cold and humid day, the others on a warmer dry day, but the camera is the same as well as the setting, 100 ISO, F4, 1.6s. It is not uncommon at all for a different optic to affect the apparent tint of an LED. Material differences and texture will alter the absorption of certain wavelengths of light. As an experiment, swap out the optic for a reflector. In my experience you will almost always see a dramatic change in apparent tint. Ya very much so, and frosted optics will appear brighter because they spread the light out more close to the camera, not down range. Plus the wider angle optic will do the same, more light close instead of projecting it. Not to mention the massive glare in high humidity from the moisture in the air. Being you used frosted (which is generally a bad idea imo, useable but in humid conditions the glare is unbearable imo) means you switch manufacturers of optics, so that changes alot of things as well. I only use the same optics as available from the same manufacturer as the stock ones. Easy to do since they are available at leddna and fasttech. Guys, thanks for your feed back on the optic change. Sorry I did not reply earlier did not appear to have been notified that some posting have been made on my thread. The optic used appear to be of the same construction and size as the one used by Ituo. From one of my emails to ITUO, I understand they are using standard optics available on the open market. I have been using this combination here in the UK since I took the last batch of photos. So during my commuting, I have been ridding with one frosted optic on the pavement side and standard on the traffic side and I can not say that I have noticed much difference, but it is hard to say without being able to cycle with both combination at the same time. On paper, for me, as a bar light this combination make some sense to have one optic of each type, so you kind get the best of both world, flood with reach! I'll have to see if I can find more optics of that design. No one seems to carry more than the standard 3 spot sizes. Which I like the 30deg the best so far. Mr mole corrupted me on elliptical optics, been trying to find some from this manufacturer. Hi, I know from some of you, this will be much too slow, but speed is not all! WELL CERTAINLY WHEN YOU GET OLDER :-)What does count is getting out and enjoying yourself. Most of the ridding it is just with the WIZ20 with standard optics fitted on my bar. During some of the ride I had the my helmet light on which is the GLOWORM X2, this was powered by two PLUZPOWER 3500mAh 18650 fitted into a CB SEEN battery box that I did a review a while back. This kind of setting allow me to be wire free as the battery cell box is mounted on my lid, 3 short video films.